The National Coat of Arms of Singapore or State Crest consists of a shield on which is emblazoned a white crescent moon and 5 white stars against a red background. Supporting the shield shall be a lion on the left and a tiger on the right. Below the shield shall be a banner with the words “Majulah Singapura” inscribed on it. Curiously, all official depictions of the coat of arms show the supporters standing on rice stalks, but the rice stalks are not mentioned in the official description. Arms: Gules, five mullets of five points in the formation of a pentagon point upwards above a crescent moon points upward Argent. Supporters: Dexter, a lion rampant guardant, sinister, a tiger rampant guardant, each standing on a stalk of padi (rice) Or. Approval: Approved by an act of the State Assembly in November 18, 1959, used starting December 3, 1959. Singapore is a multi-ethnic, multi-religious state with significant Chinese, Malay, and Indian groups. Although seventy-four percent (74%) of its population is Chinese, the government does not promote a specifically Chinese national identity or a concept of Singapore as a Chinese state. Singapore joined the Malaysia in 1963, but unlike Malaysia's other states, Singapore had a majority Chinese population. Ethnic conflict between the Malays and Chinese led to Malaysia expelling Singapore from the federation in 1965. Thus Singapore became the only country in modern history to gain its independence involuntarily. Singapore has used the same coat of arms through its periods as an internally self-governing state, a state of the Federation of Malaysia, and an independent republic. The coat of arms has the same colours and symbols as the national flag but arranges them differently. Although legislation, i.e., the Singapore Arms and Flag and National Anthem Rules 2003, refers to the coat of arms as both "the National Coat of Arms of Singapore" and "the State Crest", it is not a crest in the heraldic sense, and indeed, lacks a crest. Another heraldic anomaly is that the coat of arms' official description lacks any mention of the two rice stalks upon which the supporters stand, yet the rice stalks appear in all official depictions of the arms, including the illustration in the Singapore Arms and Flag and National Anthem Rules 2003, First Schedule. Toh also suggested the lion and tiger as supporters. The tiger is a local animal. Lions, however, do not live in Singapore. Toh stated, in an oral history interview with the National Archives of Singapore in 1989, that he got the idea of the lion from the "Raffles Crest," presumably the coat of arms of Sir Stamford Raffles, the founder of Singapore.2 However, Raffles' coat of arms has no lion on it. Toh more likely adopted the lion from two other coats of arms, those of the City of Singapore, granted in 1948, and the Straits Settlements, granted in 1911. Despite Singapore's history as a British colony, the official explanation of the lion is that it symbolizes Singapore, not Britain. The official explanation of the colours and charges is that red symbolizes universal brotherhood and the equality of man. White symbolizes purity and virtue. The five stars represent the national ideals of democracy, peace, progress, justice and equality. 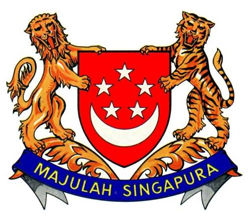 The lion symbolizes Singapore, and the tiger symbolizes Singapore's historical ties with Malaysia. The motto "Majulah Singapura" means "Onward Singapore" in Malay. "There had been much ado over the flag, for again racial sentiments had to be respected. The Chinese-speaking wanted red for good fortune, the Malays red and white, their traditional colours for courage and purity. But Indonesia already had red and white for their flag, and so had Poland. The Chinese, influenced by the five yellow stars on the flag of Communist China, wanted stars. The Malays wanted a crescent moon. We settled for a crescent moon with five white stars instead of the traditional one star for Islam. The five stars represented the five ideals of the country: democracy, peace, progress, justice and equality. Thus we reconciled different racial symbols and ideals." Since the coat of arms has the same colours and symbols as the national flag, presumably the coat of arms has the same ethnic symbolism. Both the coat of arms and national flag have five stars of five points. Five is a lucky number that recurs in Chinese culture: Chinese philosophy has five elements (water, fire, earth, wood, metal); the Imperial dragon has five claws on each paw; Tiananmen Gate has five arches; the first flag of the Republic of China has five stripes; the flag of the People's Republic has five stars; and the plum blossom symbol of the Republic of China on Taiwan and the bauhinia symbol of Hong Kong both have five petals.